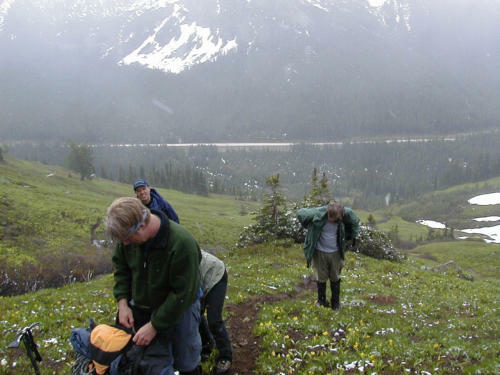 At 6:30 a.m. on June 21, six of us (Doug Schurman, Courtenay Schurman, Tom Aitchison, David Smith, Jeremy Dodsworth and Cheryl Burwell) headed west from the Blue Lake Trailhead about .8 miles to the pull-out directly opposite Cutthroat. Friday’s forecast had been for a weekend of showers off and on, and most of our other climb-leader friends had either changed destinations or cancelled their climbs altogether. Since we’d already driven the 3.5 hours from Seattle the night before, we decided to at least try the approach and see how far we could get. 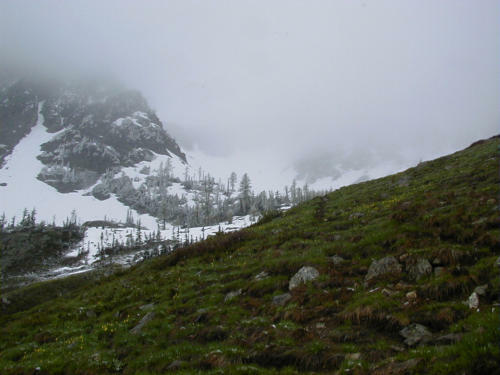 We never expected to see snow flurries on the first two days of summer. We wondered if we’d be successful on EITHER of our scheduled rock climbs! The first challenge was finding the right path down into the meadow; the most obvious path starts about 150 feet left of the culvert and guard rail at several obvious cairns, though if you descend just right of the culvert and bushwack your way through the woods you only have to cross the stream once. We went down the obvious west trail and returned bushwhacking east of the culvert. 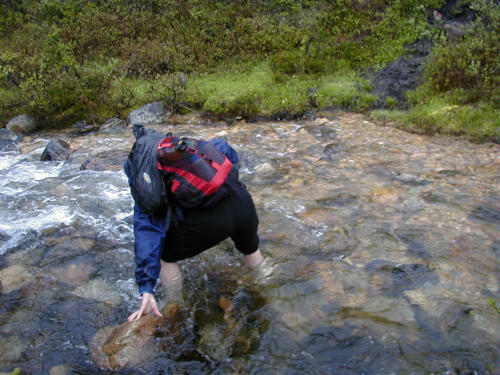 One stream crossing was in dense brush, the other several wet-stone-hops or (as four of us opted to do) wade across. 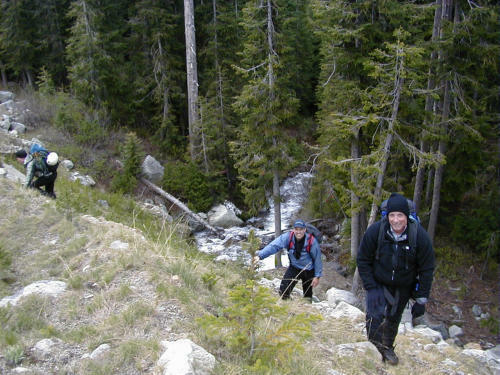 The streams crossed, we made our way quickly through the mud into the meadow, which had been softly coated with a ½ inch of new snow that morning. The climber’s trail was quite obvious heading up toward the waterfall, and by the time we reached the basin at 6600’ we were in about a foot of soft snow, with more snow coming down all around us. At this point we pulled out the map and compass to get our bearings, as we’d read that we needed to “go left of the dirt mound.” Question was, which dirt mound? Where was the summit? Would the pockets of blue we saw earlier result in clearing as it had the weekend before on Eldorado? The clouds were now pretty thick all around us, and since none of us had been on the route before, we were a bit uncertain just where we were supposed to gain the west ridge. We headed left up the “obvious gully” (phrase coined by Beckey himself, I’m sure) until the slope steepened to what felt like an icy 30 degrees. I was in the lead kicking steps without anything for my hands, then Doug borrowed one of Cheryl’s trekking poles to continue kicking, and when we saw cornices above each of the gullies leading to what we thought was the west ridge, we decided we needed to be a bit farther right. 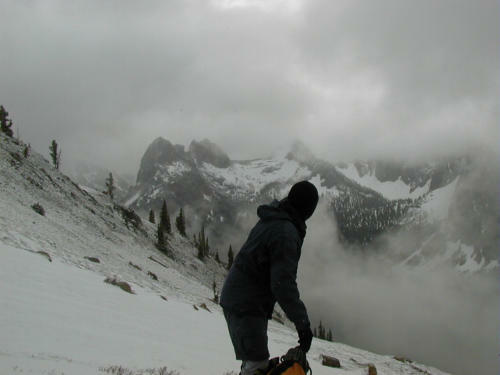 At 7,000’ the wind picked up and blew snow into our faces horizontally, causing visibility to decrease even further, and our hopes of finding the entry to the ridge diminished to zero. 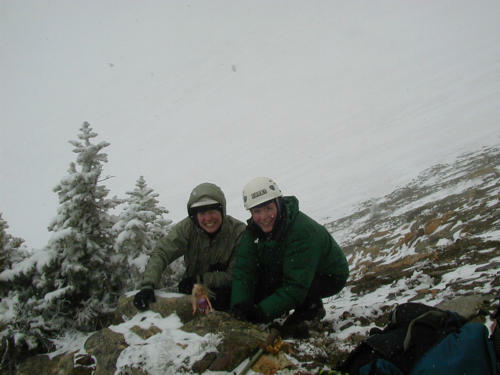 Our “summit shot” with Cheryl’s Barbie mascot was at 7,000’ at a chossy pile of debris that felt more comfortable to stand on than the thin layer of snow over ice. With everyone in surprisingly good spirits, laughing about Malibu Barbie and her bikini-clad “wet-look,” we decided we better turn around. We saw nary a soul en route except the fat marmot guarding his home. 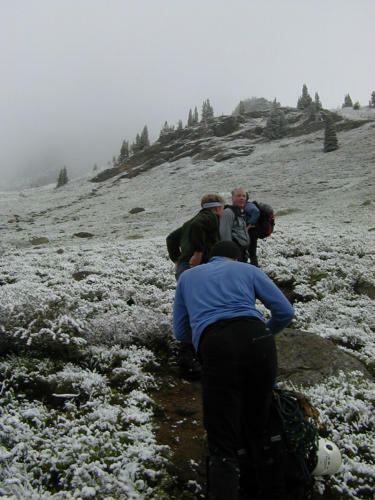 With surprisingly good plunge stepping, we hot-footed it back to the meadow, where the ½ inch of new snow in the meadows had already melted, leaving small pockets of white in a sea of green. By 11 a.m. we returned to the cars and Jeremy’s homemade cookies. We all looked back to see if by some miracle we could see the summit and the true route, but Cutthroat remained socked in for the weekend. Previous years we’d prided ourselves on being fair-weather climbers, but recently we’ve learned that many of the climbs we’d called from Seattle COULD actually go, if we’re willing to work a little harder and endure less-than-optimal weather conditions. It was a valiant and fun effort by all, as well as a great lesson in when to try a climb and when to turn around. Following is a listing of pictures in order taken. All photographs taken by Courtenay Schurman except where noted. 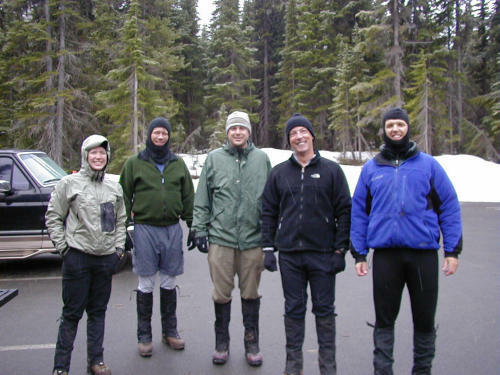 Cheryl, David, Jeremy, Tom and Doug marvel at the snow flurries on the first day of summer. 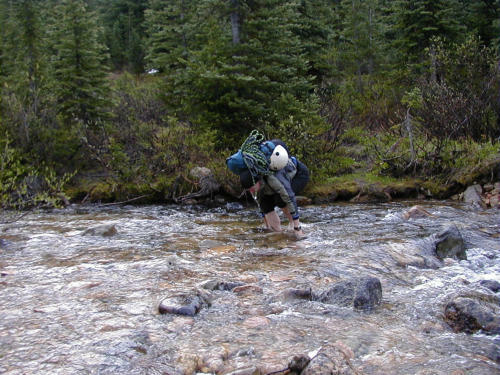 Doug wades barefoot across the second stream. Cheryl takes the plunge, holding onto a rock for balance. Fresh snow covers meadow at 5300'. David, Tom and Cheryl take a water break. Clouds engulf the Liberty Bell massif. 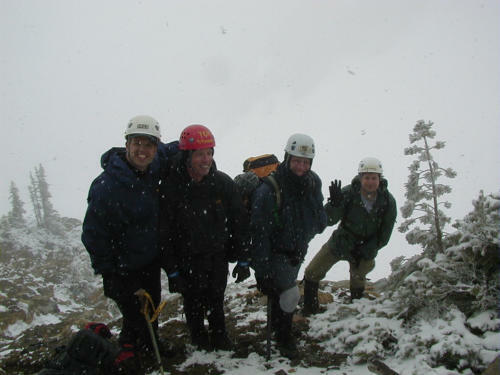 Our "summit" at 7,000' - "the guys" smiling in the snow. Cheryl, Court and Barbie -- "the chicks" at 7,000'. Barbie training for Shuksan: great little scrambler. Barbie peeks out from her perch in a bush. 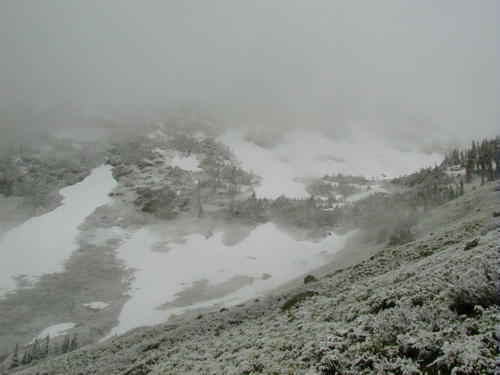 Basin view, snow melting with increasing temperatures below 6000'. 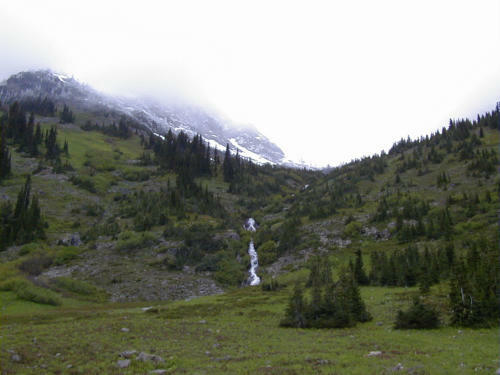 View of the waterfall and meadows. Cheryl, Doug and Tom return to the highway east of the culvert. Late afternoon view of the Basin, Cutthroat still socked in.